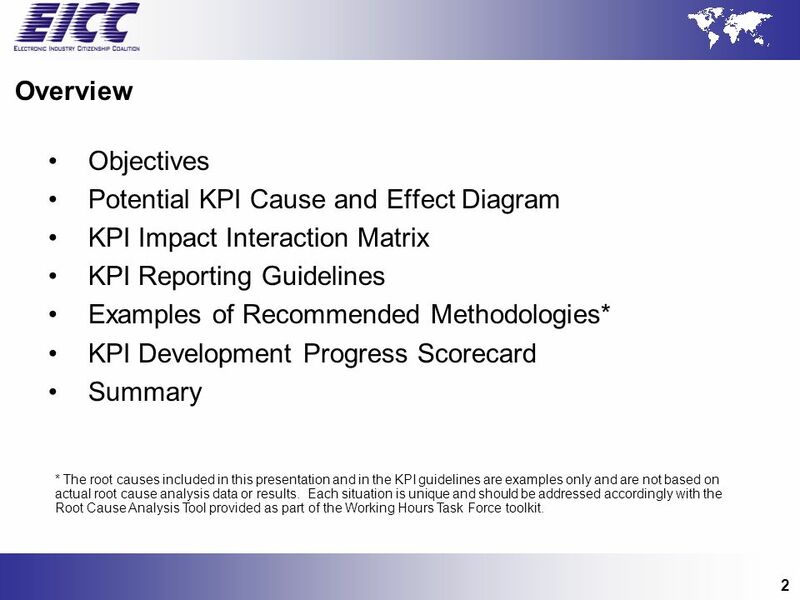 Overview Objectives Potential KPI Cause and Effect Diagram KPI Impact Interaction Matrix KPI Reporting Guidelines Examples of Recommended Methodologies* KPI Development Progress Scorecard Summary * The root causes included in this presentation and in the KPI guidelines are examples only and are not based on actual root cause analysis data or results. 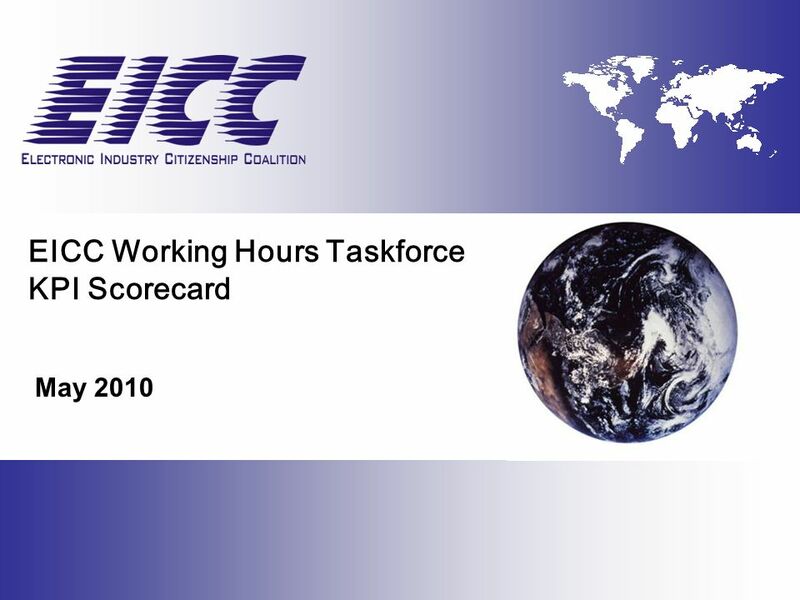 Each situation is unique and should be addressed accordingly with the Root Cause Analysis Tool provided as part of the Working Hours Task Force toolkit. 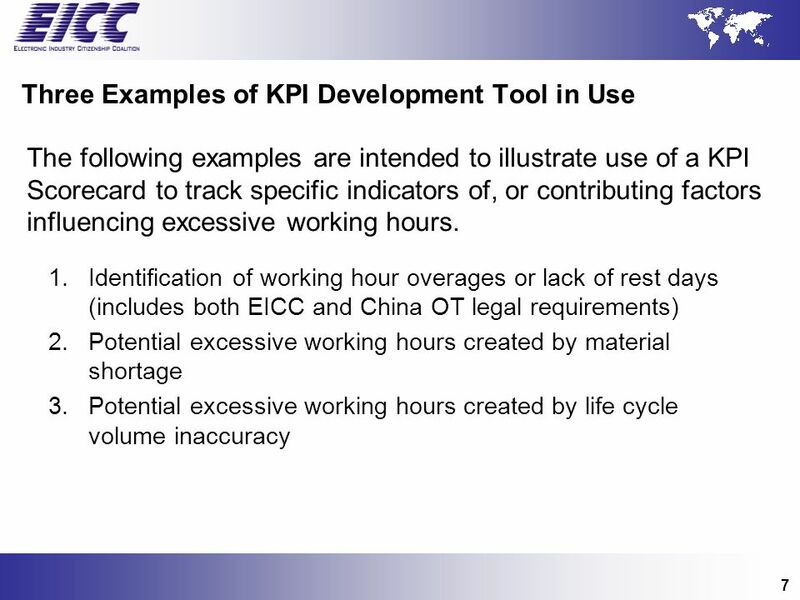 3 Objectives Provide high-level understanding of the various Key Performance Indicators that may be of value when addressing possible root causes of excessive working hours. 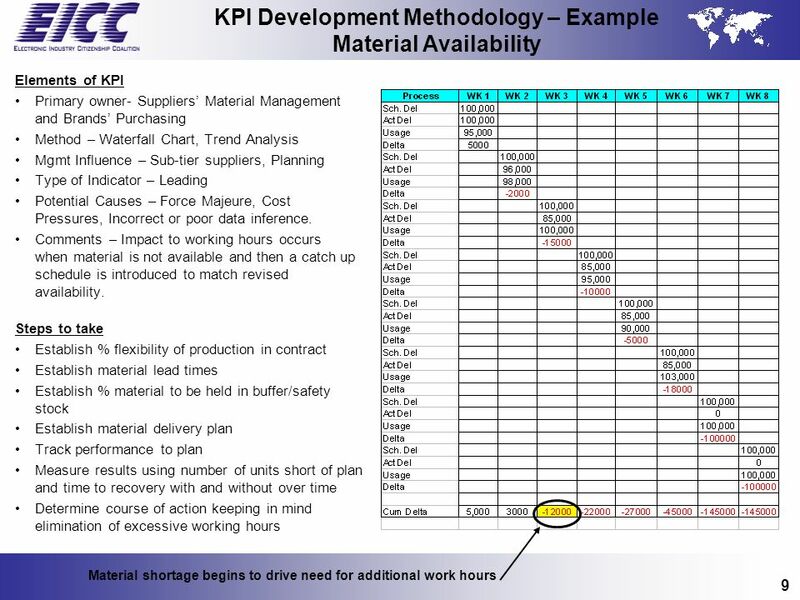 Provide an understanding of the interactions between departments within an operation that may impact working hours performance. 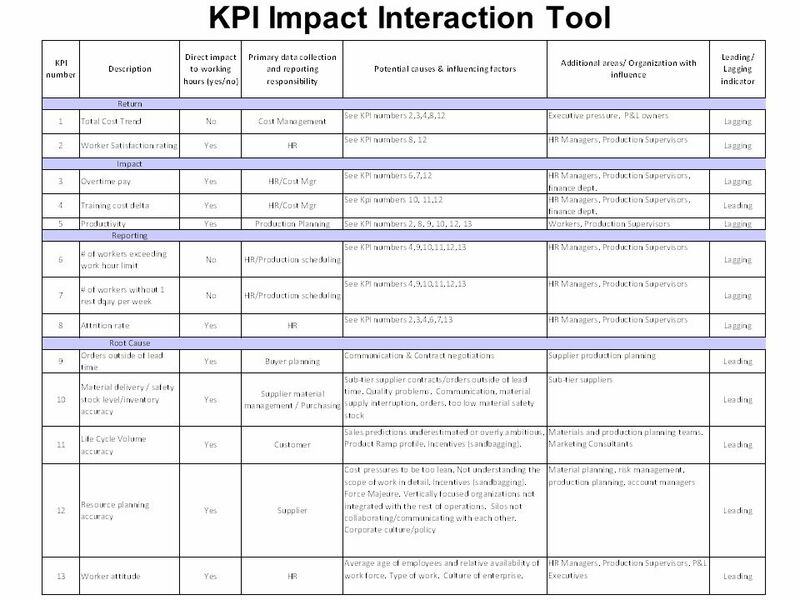 Recommend review process for KPIs. 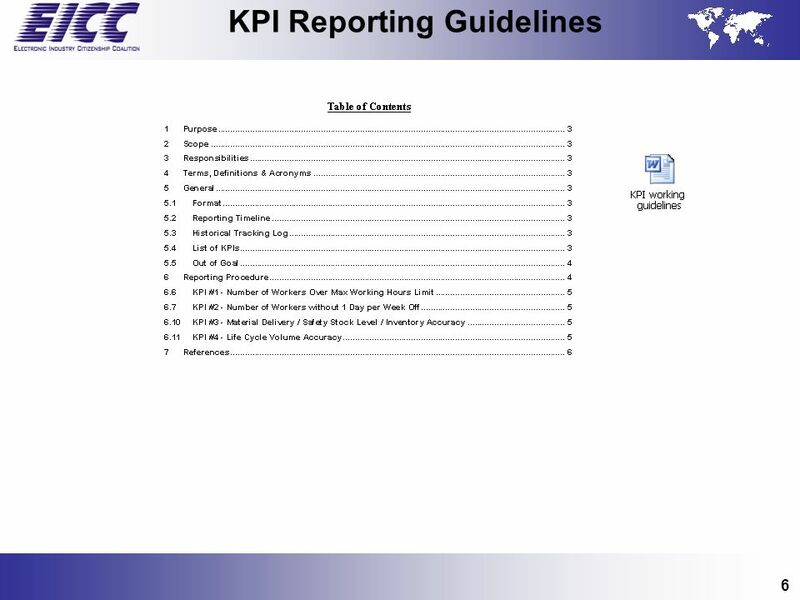 Elements of KPI Primary owner (for reporting metric) HR, Finance Method – Trend Analysis Management Influence – Sales, planning/forecasting, HR/workforce planning, operations, materials Type of Indicator – Lagging Potential Causes – Orders exceeding capacity, unexpected demand, lack of required workforce resources, material availability Comments – Requires accurate weekly/monthly data reporting from time and attendance system Steps to take Establish methodology to extract time & attendance data Collect and report out working hour and rest day data on weekly basis Analyze working hour (and rest day) data to determine whether it meets EICC and local legal requirements Identify potential trends and root causes of work hour overages; implement plans to address root causes Continue to track performance against EICC/local legal requirements and address overages Work hours and rest days meet EICC requirement, but fail to meet China OT legal requirement for Feb – Sept. 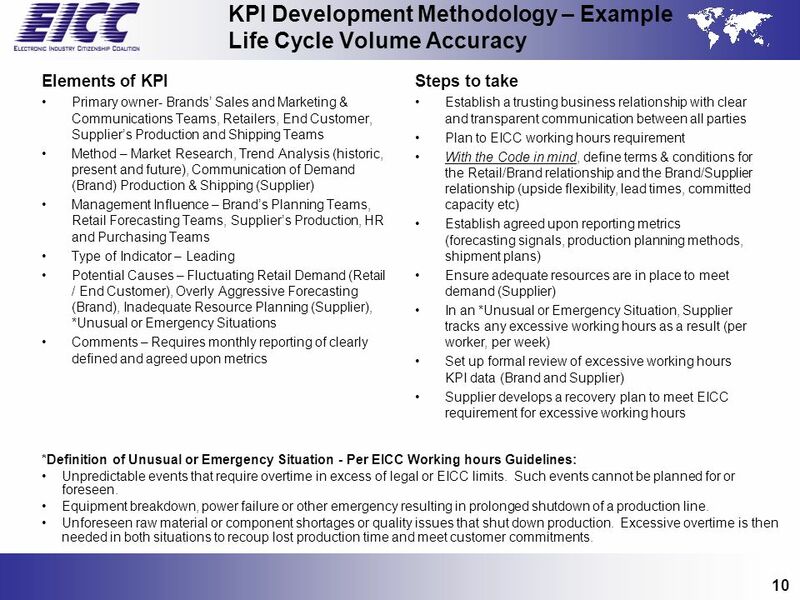 Elements of KPI Primary owner- Brands’ Sales and Marketing & Communications Teams, Retailers, End Customer, Supplier’s Production and Shipping Teams Method – Market Research, Trend Analysis (historic, present and future), Communication of Demand (Brand) Production & Shipping (Supplier) Management Influence – Brand’s Planning Teams, Retail Forecasting Teams, Supplier’s Production, HR and Purchasing Teams Type of Indicator – Leading Potential Causes – Fluctuating Retail Demand (Retail / End Customer), Overly Aggressive Forecasting (Brand), Inadequate Resource Planning (Supplier), *Unusual or Emergency Situations Comments – Requires monthly reporting of clearly defined and agreed upon metrics Steps to take Establish a trusting business relationship with clear and transparent communication between all parties Plan to EICC working hours requirement With the Code in mind, define terms & conditions for the Retail/Brand relationship and the Brand/Supplier relationship (upside flexibility, lead times, committed capacity etc) Establish agreed upon reporting metrics (forecasting signals, production planning methods, shipment plans) Ensure adequate resources are in place to meet demand (Supplier) In an *Unusual or Emergency Situation, Supplier tracks any excessive working hours as a result (per worker, per week) Set up formal review of excessive working hours KPI data (Brand and Supplier) Supplier develops a recovery plan to meet EICC requirement for excessive working hours *Definition of Unusual or Emergency Situation - Per EICC Working hours Guidelines: Unpredictable events that require overtime in excess of legal or EICC limits. Such events cannot be planned for or foreseen. Equipment breakdown, power failure or other emergency resulting in prolonged shutdown of a production line. Unforeseen raw material or component shortages or quality issues that shut down production. 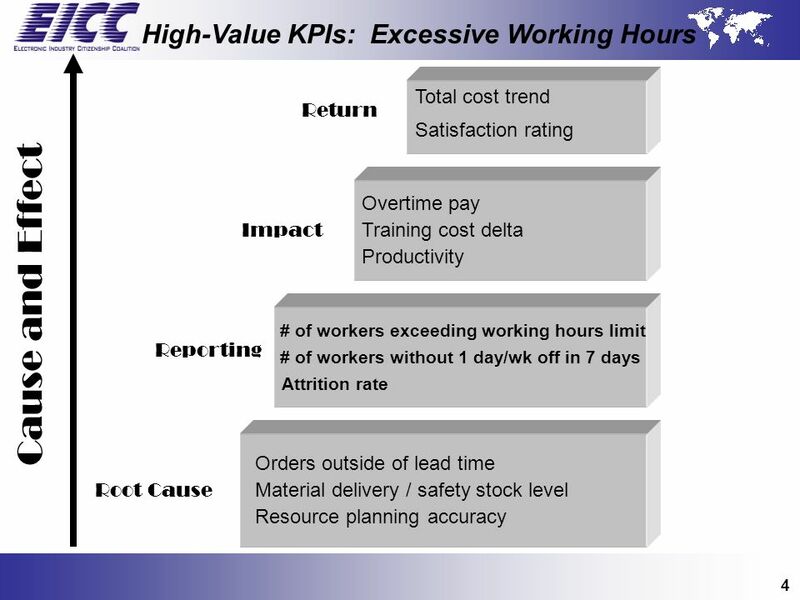 Excessive overtime is then needed in both situations to recoup lost production time and meet customer commitments. 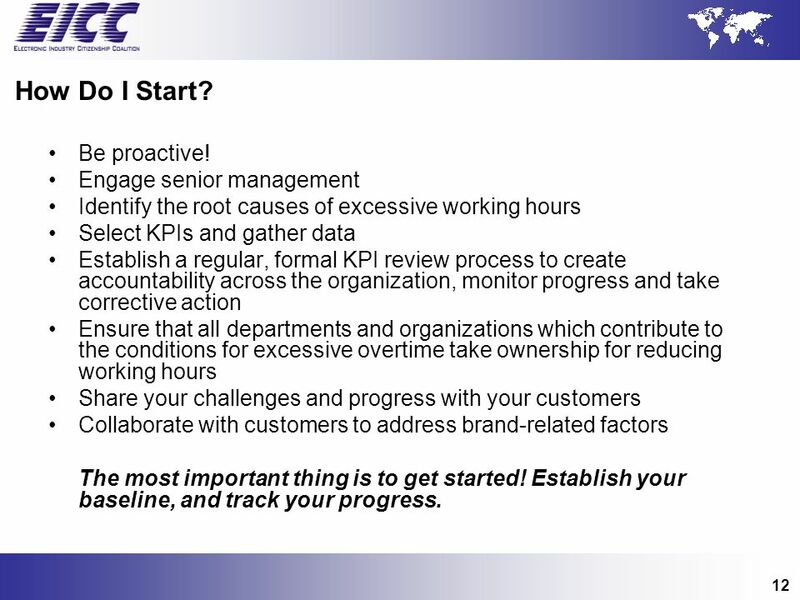 Identify the root causes of excessive working hours Select KPIs and gather data Establish a regular, formal KPI review process to create accountability across the organization, monitor progress and take corrective action Ensure that all departments and organizations which contribute to the conditions for excessive overtime take ownership for reducing working hours Share your challenges and progress with your customers Collaborate with customers to address brand-related factors The most important thing is to get started! Establish your baseline, and track your progress. 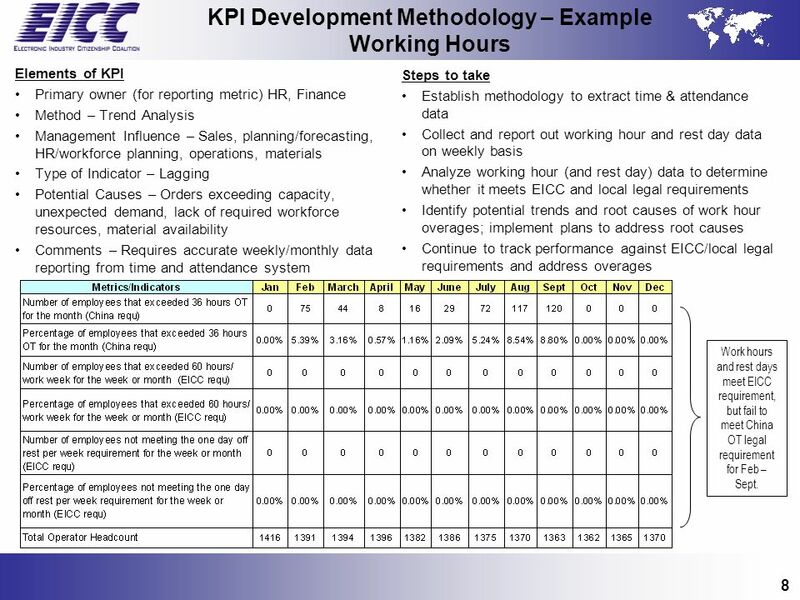 Download ppt "EICC Working Hours Taskforce KPI Scorecard"
Getting the most out of your contracts Gary Traynor 11 th July 2013 Performance Monitoring Contractor. AG Barr Proc 1 © The Delos Partnership 2003 Sales Forecasting and Demand Management The process. 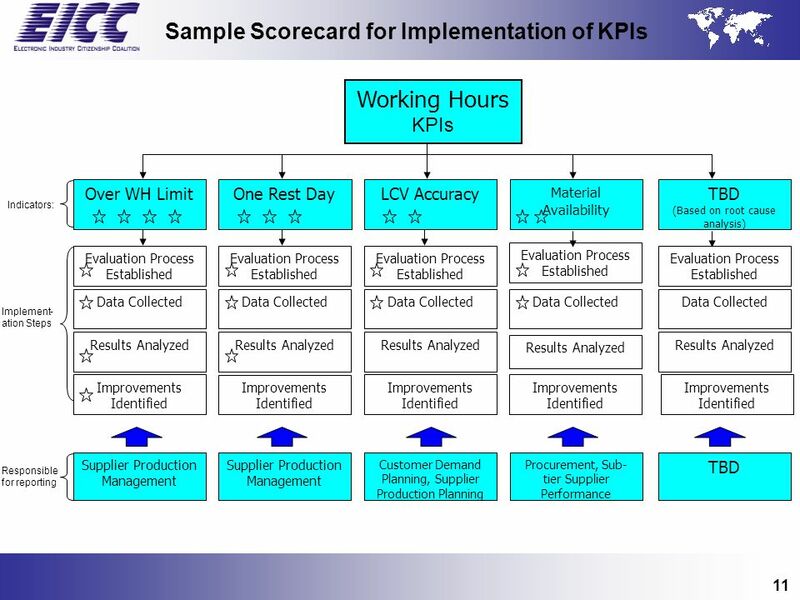 Best of the Best Sales and Operations Planning Conference Using S&OP in Companies with Lean Manufacturing Bill Kerber, CFPIM. Chapter 2. Customer service The group of utilities or benefits the customer expects from the supplier. Sven Eppert and Thomas Kapfhamer 26 May 2003 Warsaw School of Economics International Logistics Prof Krzysztof Rutkowski CPFR - the new edge in logistics. Target Costing If you cannot find the time to do it right, how will you find the time to do it over? Position Title: Band: Location: Reports to: Supervises: Sales Manager / Regional Sales Manager AVP On Site General Manager, Sales Job overview Achieve. 1 © 2006 Accenture. All rights reserved. Overview – Processes Overview Policies and processes often need to be updated when there is internal change. A. Computer Engineering 203 R Smith Project Tracking 12/ Project Tracking Why do we want to track a project? What is the projects MOV? – Why is tracking. To Accompany Russell and Taylor, Operations Management, 4th Edition,  2003 Prentice-Hall, Inc. All rights reserved. Resource Planning Chapter 14. Supply Chain Management: From Vision to Implementation Chapter 4: New Product Development Process: Managing the Idea Infrastructure.